This homemade Semolina Pizza dough will turn you into a crust lover if you're not one already. Must try once!!! Melt the butter in the pan and then add tomato puree.Stir continuously and cook till you see the bubbles coming out of the puree. Then add all the ingredients as mentioned above in the pizza sauce column .Cook for 5 minutes and turn off the flame. Add dry yeast and sugar into warm water.Let it rest to rise for 10 minutes. Combine bread flour, semolina flour and salt into one big bowl. When the yeast is ready, add 1 tsp of olive oil and mix well. Then add the combined flour into the yeast mixture and knead the dough for about 10 minutes. After you knead the dough,apply little oil and smooth out the dough and place it into the greased bowl and wrap it using plasti wrap. Keep the dough in the warm place and let it rest for 1& 1/2 hours. Cut the all the veggies and make the toppings ready. Dust the rolling board with some plain flour and roll out the dough into 11 inch of circle. The rolled dough should not be too thick or too thin. 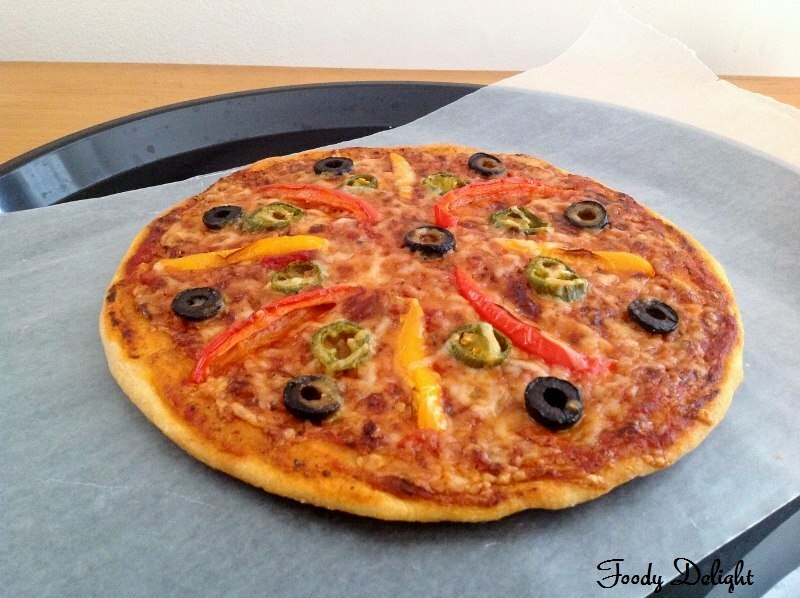 Apply the pizza sauce on the rolled out dough, spread the toppings and cheese. Place the tray into the oven and bake for about 15 minutes ,till the pizza crust becomes light golden in colour and cheese becomes sticky. 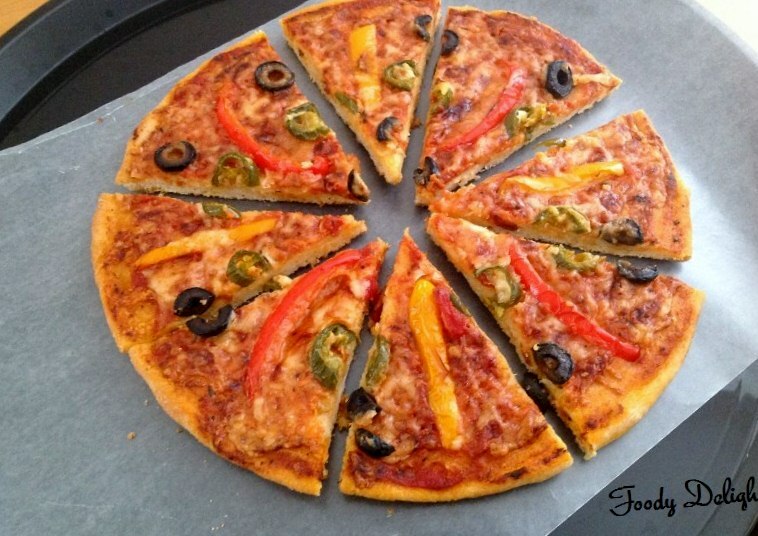 The ingredients I have mentioned above makes two perfect medium pizza. If you don't use all of your dough, you can put remaining dough into well oiled baggies and refrigerate for a day or freeze. Wow Pranjali .. thats an amazing Pizza with decorative toppings.. I dont usually add semolina in the dough, but would love to give it a go.. 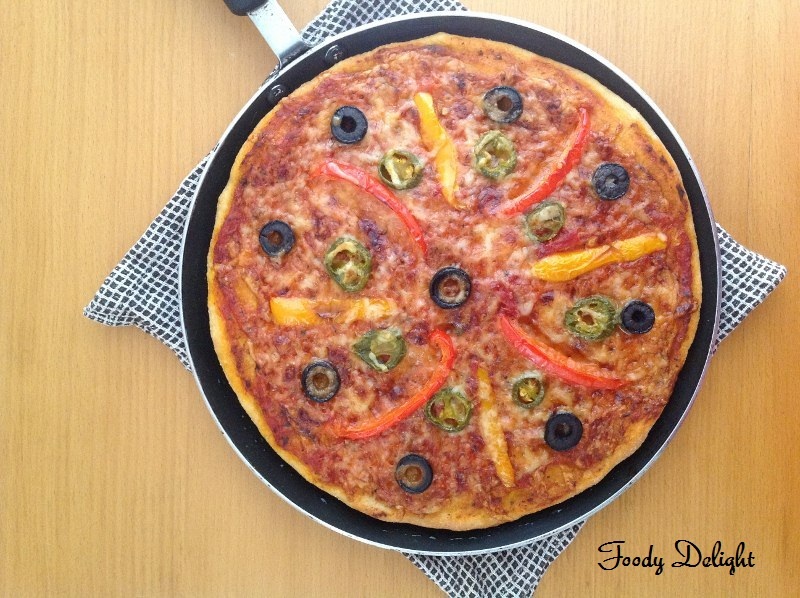 Adding semolina sounds awesome and definitely interesting..
pizza crust with semolina sounds interesting...looks too good n tempting n u have made it perfectly...nice clicks dear!! Never tried with semolina,would love to try! What an amazing pizza!! Looks just perfect! 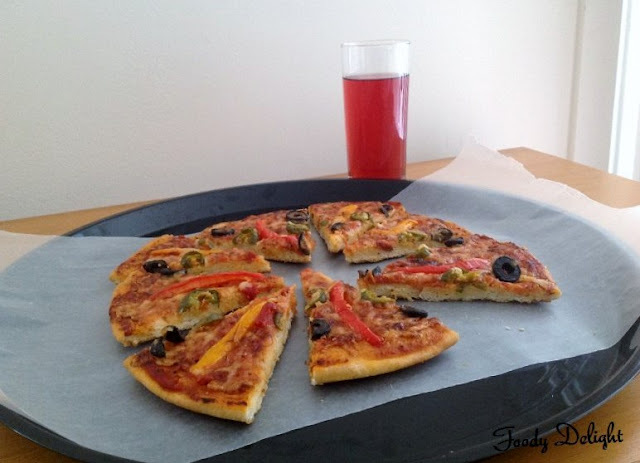 hmmmm...tht sound YUMMY..bookmarked :D..superb pic..ur pizza is calling me..slurp slurp!! !